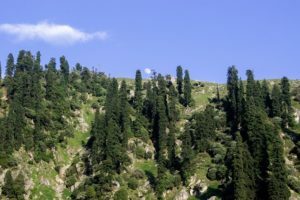 Hill stations nowadays are no more than crowded towns at high altitudes. 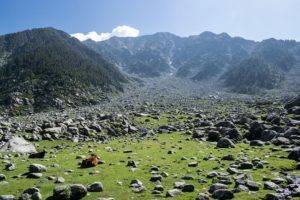 Treks to Triund and Kheerganga are getting too popular and as a result are in the process of getting ruined by litter, noise and ignorance of ‘educated’ people from the cities (yes, that is us). 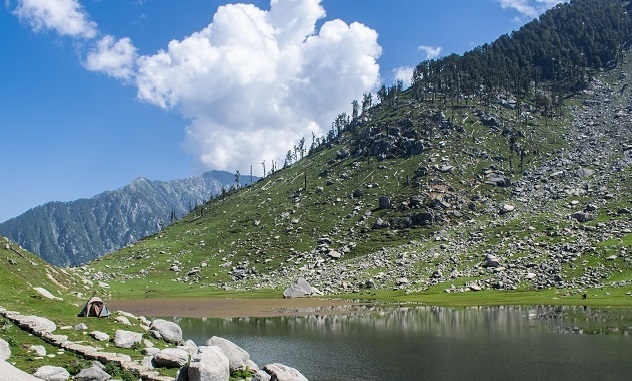 Still pristine and lesser known is this 13 kms long trek that starts from Kareri village. 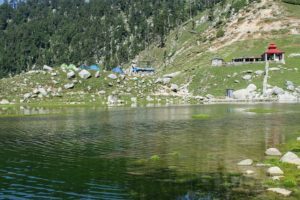 As a beginner with little experience, if you are looking for a trek in the mountains near Delhi and need some fresh air along with some spectacular views, the trek to kareri lake fits the bill perfectly. 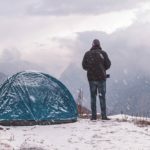 Let us have our adventure, but also learn to trek responsibly. 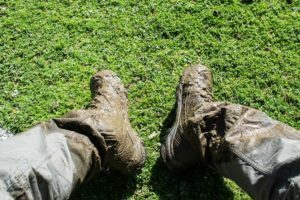 Now, I have done a lot of solo treks and make it a point to read a little bit about the trail and this was no different. 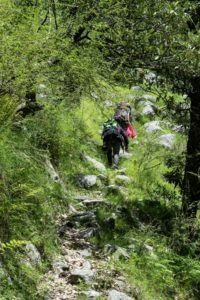 The trail starts from Kareri village and joins a road in 15-20 mins which leads to a bridge from where the main trek begins. Having known this, I started with the company of a couple and a few others as well. The trail seemed clear and as an established rule, we kept following it. Gradually the trail started getting narrower and we realized that it was the wrong track; so much for my knowledge of the trail. It was only me and the couple now; the others it seemed had changed their course some time back. It was 2 hours into the forests; we still decided to go on until we finally caught up with the main trail which guessed, would not have been too far away. The trail had all but ended and we opted for some adventure; ascending the mountains without a trail, fighting the tall bushes, retreating and then again looking for some other way. Another hour passed and we had realized that something was definitely wrong. It was not just the wrong trail; we were climbing the wrong mountain. It was decided that we should retreat. It was about 4 in the evening and we were back at the same little cafe treating ourselves to some packaged juice and noodles where we were 5 hours back. I found in myself a case of stupidity and the situation funny. 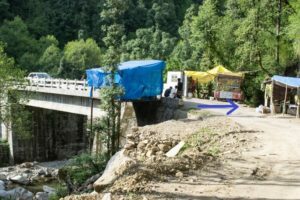 As mentioned above, the way through villages will ultimately lead to a road which reaches the bridge and this is where the trek to the lake begins. It must be just a little more than half and hour from Kareri. A right turn just before the bridge(picture below) and you are well on your way. No further instructions required as the trail is pretty much clear henceforth. Down with fatigue but refreshed from a break, we started again on the right trail. I decided to stay at Reoti, which was halfway down the trek. I learned that camps would be available there. Every step was getting difficult since I had been carrying a 55 litre backpack too which was filled with unwanted stuff. I had intentionally got it heavier just to get used to it and train my shoulders. It served the purpose more than my imagination, though. 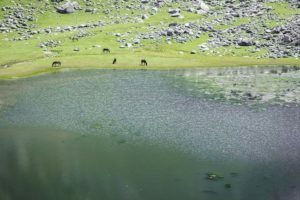 Also read: Solo trek to Deorital lake and Chandrashila summit. You can too. 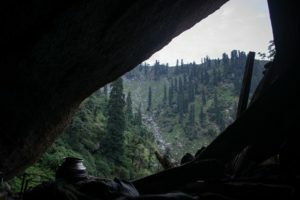 The trek was a decent ascent through forests to mountains and a stream intersected it within the first couple of kms. I kept going. It was 2 and a half hours when i finally caught sight of a tea stall on the rocky mountains where the waterfall flowed through the valley. I threw my bag in relief and sat down. ‘Done for the day’, I told myself. It was here that I met Bablu, my saviour. He invited me to his little cafe/shop(named Gufa Cafe) and gave me the option of sleeping in a cave, he implicitly owned. The cave could easily accommodate me and he had an extra sleeping bag. I was overwhelmed. I had no second thoughts. This saved me from another 300m tiring climb to Reoti and provided an experience raw enough to remember. I sipped black tea at the evening twilight as the colors of the skies gradually faded. More trekkers could be seen,tired and eager to reach Reoti. I lay down and counted stars as dinner was underway. 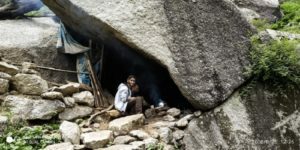 Fresh rotis and potatoes were cooked by Bablu at the cave itself. In no time, I gulped it down and slept on a bed of leaves; smug and carefree. This was a night to remember. The gentle rays of the moon kissed the valley and the mountains resonated with the gushing sound of waterfall. View from my room at dawn. Priceless! 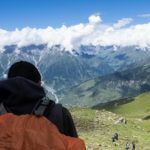 I woke up before the sun to the amazing view of the quiet valley and started the trek. Now I was quite sure I would be all by myself before someone started barking at me. I tried to calm him down. 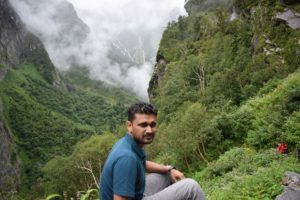 He introduced himself as Kaancha, the fittest trekker there was in those mountains who had completed the trek a record 253 times. I told him that that there was really no need to accompany me since the trail was pretty clear. He insisted. I agreed. We made friends and trekked a little more than 2 hours soaking in the first rays of the sun. 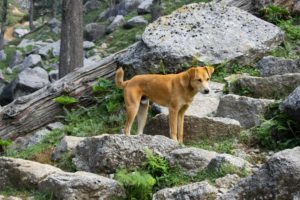 Kaancha would now and then, run here and there looking for food in every packet he could find but never went out of sight. He turned back and made sure I was on the right way. He though made it a point to bark at every cow he could spot. It was though just a statement he was trying to make to them; never serious. I pat him and tried clicking pictures but he didn’t seem too interested. Trekking was fun for him; pictures didn’t matter. 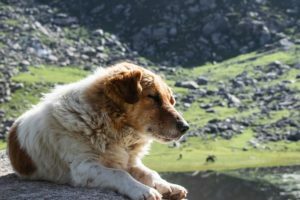 Finally after reaching the lake, I offered him his favourite pack of biscuits(Parle-G) and we bade goodbye to each other. In a nutshell, he reminded me everything about the life of a nomad. Reoti to Kareri lake is about 6kms. The trail is upward, chasing the waterfall. 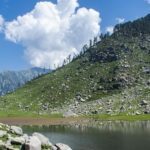 It is well defined and the whole trek from Kareri village to the lake can be made in 5-6 hours. The origin of the waterfall is the Kareri lake. The lake is pristine and you would find horses and cows gazing around the green meadows surrounding the water body. 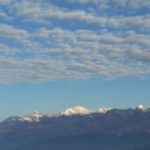 The Dhauladhar mountains cover the other side of the lake. There are also a few shops near the Shiva temple providing food and tents. It was an adventure nevertheless and yet another episode of amusement. Warning : Too much enthusiasm and adventure may lead to this. The Dhauladhar mountains on the other side of the lake. The Shiva temple and the tents overlooking the lake. Length: 13 kms. 5-6 hours. Best time: March-June and October-December. Avoid monsoons. Stay: Camps available at Kareri, Reoti(at halfway) and at the lake too. Same goes for food. 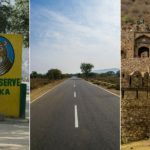 Limited buses(2-3 in the whole day) run from Dharamshala to Ghera village(1 hour distance). Please inquire at the Dharamshala bus stand about the timings since it keeps changing. Shared jeeps ply from Ghera to Kareri(half an hour). Needless to say, take an overnight bus from Delhi to Dharamshala. More from the trek ! Aunty sahi raasta kaha hai. Bas beta udhar. Udhar kidhar aunty ? Bas wahi par. She tried her best though. Apun ko toh bas nap maarna hai ! 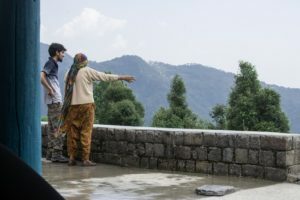 Dekho chaand aaya. Chaand nazar aaya. Experience the fascinating ‘temples under water‘. 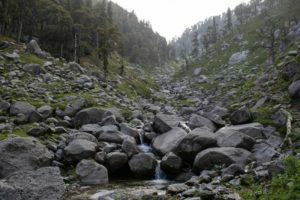 Explore the lesser known Naddi – 15 mins from Mcleodganj. I find it fascinating to read your experience,adventurous and with every detail. Your selection of words and yr vocalubory is improving ,keep it up.My blessings r always with u.